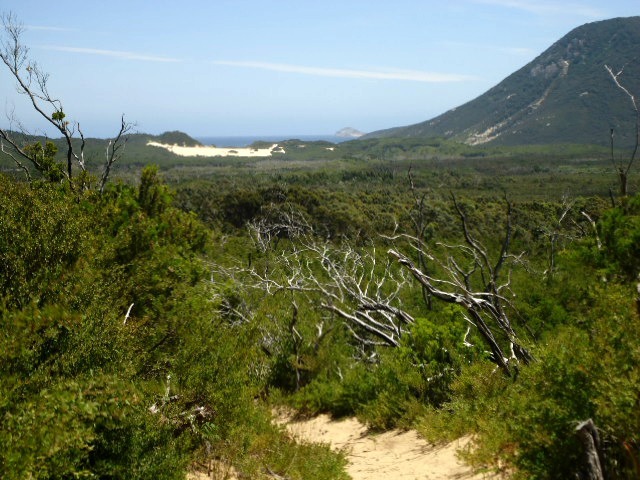 Below is my recount of Day Three on my first 3-day solo hike, in Wisons Promontory National Park. You can catch up on Day One here, and Day Two, here. I awoke to the sound of chatter in the school camp next to me. Porridge was on the menu from what I could gather, from the conversations that wafted over the noise of clanging pots and pans. I lay in bed, content, watching beads of rain occasionally roll down the outside of the tent fly. Rain had fallen on and off during the night, droplets of water pinging on the tent sounding like the twang of a rubber-band flicking on taut plastic. I had no idea what time it was, only that it was morning. I sensed an overcast sky, but was too comfortable lying in my sleeping bag to contemplate unzipping it and opening the tent to find out. So I lay there, dozing occasionally, until I heard the words I had been waiting to hear: “OK guys, let’s go”. I waited, until all I could hear was the silence, tip-toeing back into camp and filling up all the empty spaces. Only then did I emerge from my tent, rustling leaves underfoot as I shuffled over to the Trangia to make my breakfast, with solitude, my only companion. I savoured the quiet as I made my porridge and boiled water for a cup of tea; the only meal I had left after being ravaged by ravens. Light fell through the Lily Pily trees, illuminating their foliage in a lustrous shade of emerald-green, while tiny wrens flittered through the leaf litter in the vacant camp next to mine. I sat on a log, eating my porridge slowly, and listened to the waves rolling in somewhere beyond the sand dunes. Time stood still here, each moment pared back to nothing more than a state of being. There was no keeper of time here, in this wild place, no routine or roster, no clocking in or clocking out. Life here was simple, governed only by the rising and setting of the sun, and the pull of the tides. I could feel myself beginning to surrender. 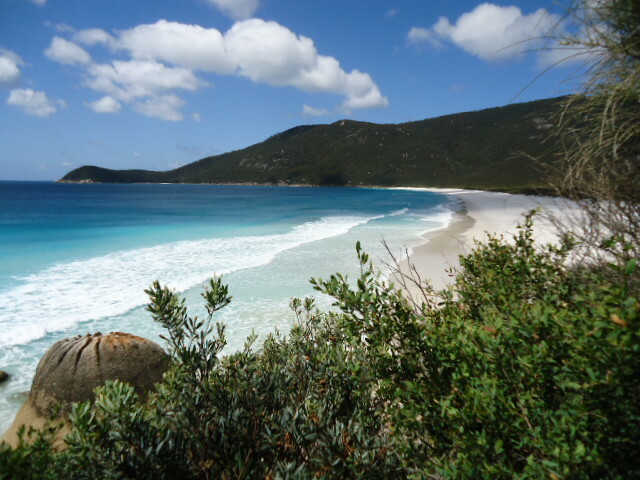 When I was ready, I left Little Waterloo Bay, heading south, hugging the coastline to the east, fringed with granite boulders that rose out the water like giant, upside-down washing tubs. Occasionally, in the shallows, egg-shaped rocks broke through the surface in small clusters, as though a hand-full of giant marbles had been rolled and left to settle. The water, a rich shade of ultramarine in the distance, eased its way into shore, increasing in lightness as it blended with the white sand below. Around the base of the rocks, water foamed, thick and frothy, creating concentric rings that burst into a fizzy spray and dispersed in the breeze. 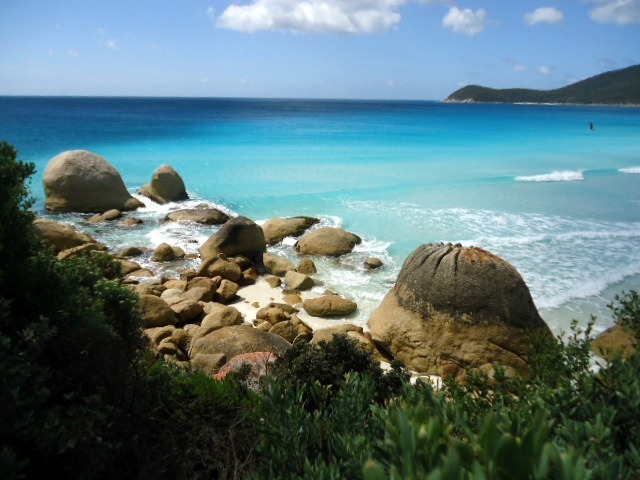 Granite boulders on the north end of Waterloo Bay. I scrambled down through the boulders, to stand alone on the shore. The sand, as white as crushed quartz, glimmered in the sun, blindingly bright against the glassy, aquamarine shallows. To the south-east, Waterloo Point rose up in the distance, a dark green mass, curving back in on itself to create a small alcove known as Home Cove. Salt spray filled the air as the wind coursed in from the east, and puffy, white clouds chugged overhead like the smoke from a steam-train’s chimney. Reluctantly, I left the beach and turned westward, heading inland and across an open marsh, covered in tightly-packed shrubs no higher than my knees. I followed a slatted-timber path for awhile, the horizontal planks, bleached ghost-grey by the sun, resembling the sleepers of a long-forgotten railway line. I stood still and looked around. I was roughly in the centre of the marsh, a wide open space full of vastness that stretched out to the north, south and west, where it was met by the vertical rise of the mountains. Silence blew in on the breeze, dancing with the currents that wafted across the marsh. A lone gull flew overhead. I watched as clouds drifted high overhead, white cotton-wool puffs that sailed past against a back-drop of Norfolk blue sky. It was then that it came to me. A feeling of euphoria, mixed with a lightness of being, almost transcendental, that made me feel, in the midst of this vast open space, fully alive. I felt an irrefutable connection to this place, a sense of belonging, and of being a part of something that was far bigger than me. I savoured the feeling, looking at it from every angle, as though by doing so, I could draw upon the memory of it in the days ahead, with every minute detail in glorious technicolour. How I wished it could last forever. 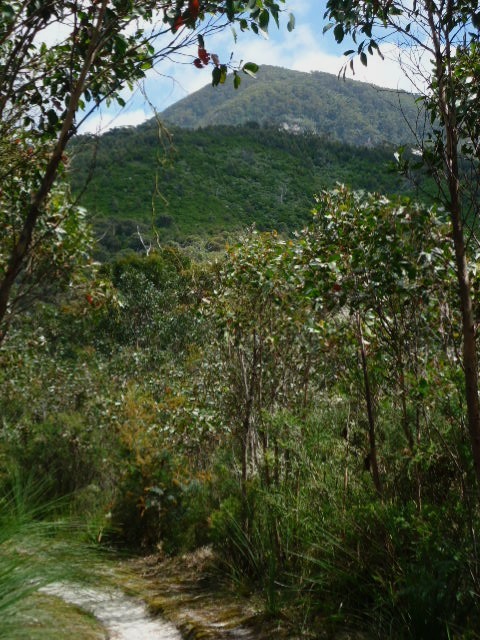 I walked on, the marshland giving way to eucalypt scrub, and began to climb toward a saddle. I was walking well enough, despite being hungry, but my blisters bothered me. From time to time, I could feel liquid in the bubble under my big toes squelch with the roll of my feet, and I wondered when they would burst. 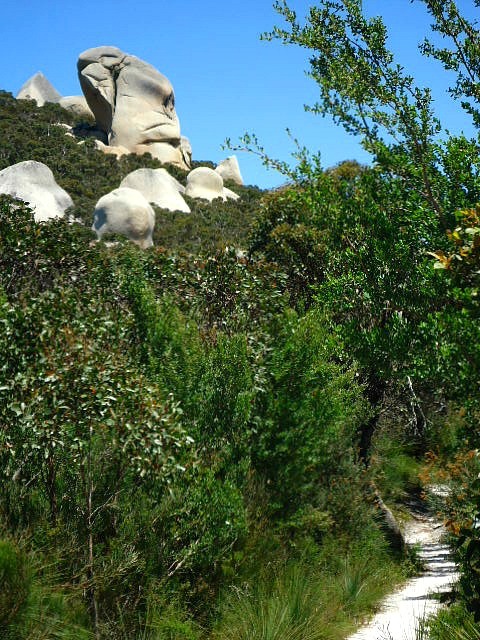 From the saddle, I could see Mussolini Rocks in the distance; a cluster of granite rocks rising haphazardly up out of the greenery like a selection of Easter Island statues. As I got closer, they seemed to look down on me, their cold, stony gaze, imposing and sombre. 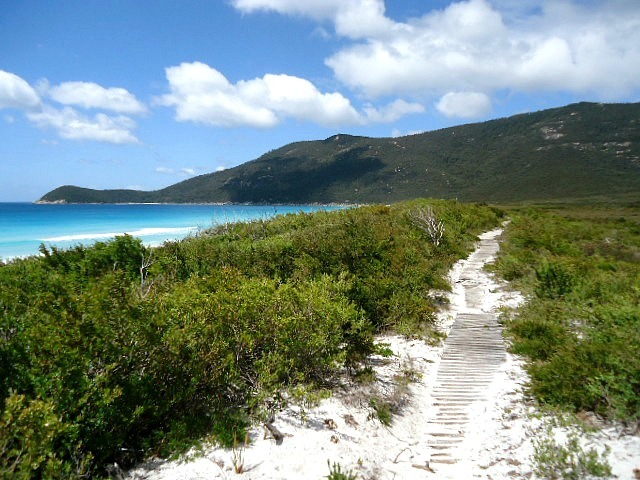 I walked for some time over white, sandy tracks, bordered with crushed granite that glinted, mirror-like, under the glare of the midday sun. 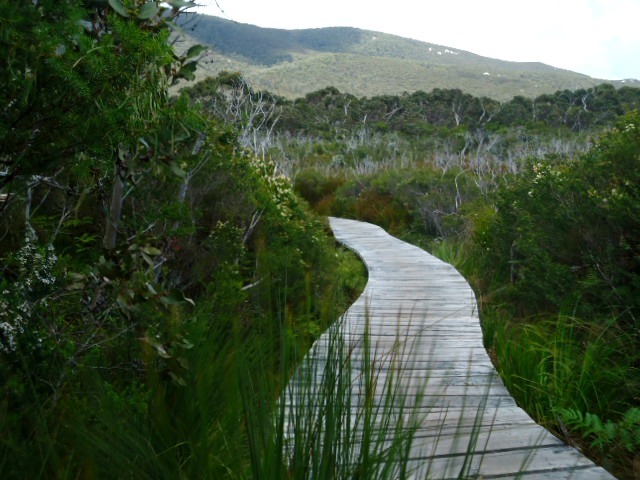 I followed the lay of the land, cresting small saddles with views toward Oberon Bay, and descended into swampy gullies that were lined with sedges that towered above me, rustling in the breeze. The sun beat down on the back of neck and legs, sharp and tangy on my skin, and I could tell I was getting sunburnt. But all the while, my eyes feasted on the wildness around me, and I could feel it, leaching into my very soul, as though filling up a large vessel, right to the brim. I stopped at Telegraph Junction, its west side flanked by a stand of Tea-Tree, and thick with shade. A horizontal branch lodged between a fork in two trees, just metres apart, formed a make-shift bench-seat. 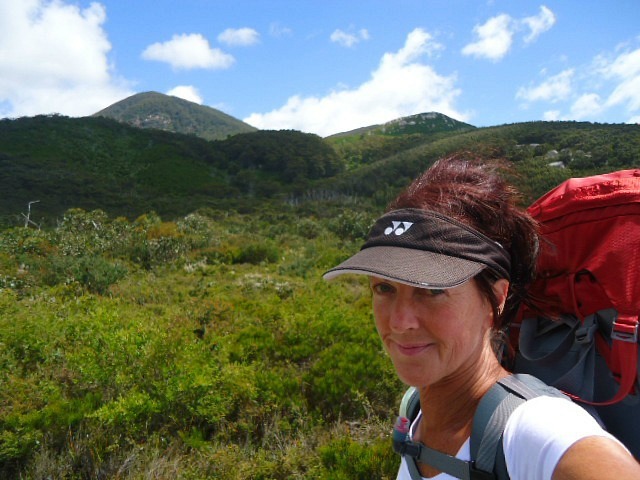 I dropped my pack and sat on the seat, while the Tea-Tree creaked and groaned eerily all around me in the wind. At times I thought I could hear voices, although I knew no-one was there, and I had the feeling I wasn’t entirely alone. I guessed it was lunch-time, although I had been hungry for ages, and decided to dig out my last piece of Lindt chocolate. I savoured it, slowly, making sure I got every last skerrick that had melted into the foil. When that was gone, I got out the only thing left in my pack that was edible; milk powder. I ate spoonfuls of it, mixing it with the saliva in my mouth until it formed the consistency of melted cheese. It was surprisingly nice, and at the very least, gifted me with the sensation that I was actually eating something. I thought of Cheryl Strayed as I sat there, and recalled that in her book “Wild” she had done likewise, eating her Better Than Milk powder when food was scarce. I thought too, of Chris McCandless, from his story in “Into the Wild”, and how frightening it must be, to know that you have run out of food. What would it be like, to face the possibility of starvation; to know that ultimately, you could die if you didn’t find food? What about the millions of people around the world, who face this dilemma every single day? Still hungry, I pushed on, finding an easy rhythm to my walking that made me feel as though I was doing a moving meditation. When I began to tire, I would repeat my mantra, over and over: walk, 2, 3, 4, walk, 2, 3, 4, as though I was doing an army-style drill. On the word walk, I would swing my trekking pole forward, the tip of it striking the ground with a deliberate thud, then I would push off with the remaining 2, 3, 4. It stopped me from thinking about my sore feet, and made me focus on each moment, in a flowing continuum. I realised, as I walked toward the end of the trail, that despite at times feeling weary, and hungry, I never desired to reach the end quicker, or to be somewhere that I wasn’t. It wasn’t about getting from one place on the map to the next; it was about experiencing everything that the track had to offer. At times it was pure bliss, and at times it was hard work, but at the end of it all, I had collected a bag full of experiences bigger than the pack on my back. I had cut loose from mainstream life, carried 18 kilos of food, water and shelter on my back, walked solo through the wild, and emerged triumphant and enriched for having done so. That, was what it was all about. Congratulations, Leah! What a walk! I found the same sense of serenity on reaching the lighthouse – and although I don’t have childhood memories of the Prom like many Melburnians, I have since fallen in love with the place. There’s so much to discover there – and about ourselves, too. I’m trying to catch up on a few things while on holidays; your blog is one! Love your style of writing very engaging , I’m heading their this coming weekend I hope to experience some of what you wrote, not the loss of food!